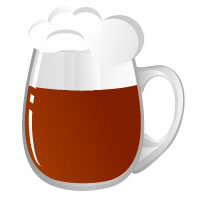 All Grain Dark American Lager homebrew recipe. This homebrew recipe uses the following ingredients: Pilsner - DE, Munich - Light 10L - US, Victory Malt - US, Flaked Corn - US, Carapils - Dextrine Malt - US, Chocolate Malt - US, Carafa II - DE, Saaz Hops, Liberty Hops, Fermentis Saflager W-34/70 Homebrew Yeast. This recipe was cloned from Yoopers Cream Ale.